Title: So Who is Supposed to Get tPA for Stroke Nowadays? Intravenous (IV) thrombolytics for stroke remain a controversial topic for emergency medicine (EM) physicians, with numerous editorials and articles questioning the strength of the recommendations by the AHA in 2018. Nevertheless, it is prudent for the emergency medicine provider to be aware that administration of IV tPA is a Level I recommendation in any stroke patient with a time of onset (or last known normal) up to 4.5 hours in patients with no contraindications. Clinical judgement should always direct care, and documentation for deviation from the guidelines (if any) should be done. IV tPA should be given in all stroke patients as mentioned above even if they are being considered for endovascular thrombectomy. Acute respiratory failure (ARF) is the leading cause of ICU admission for immunocompromised patients. While infectious etiologies remain the most common cause of ARF in these patients, there is an increasing prevalence of non-infectious, treatment-related causes. Immune check-point inhibitors (ICIs) are now used with increasing frequency, and can cause severe pulmonary toxicity in approximately 6% of patients. Ferreyro BL, Munshi L. Causes of acure respiratory failure in the immunocompromised host. Curr Opin Crit Care. 2019;25:21-8. Post tonsillectomy hemorrhage occurs and 0.1-3% of post tonsillectomy patient's. It occurs typically greater than 24 hours after surgery and up to 4-10 days postoperatively. A survey of otolaryngologists showed that ED management strategies for active bleeding have included direct pressure, clot suction, silver nitrate, topical epinephrine, and thrombin powder. This article was a case study demonstrating the use of nebulized tranexamic acid (TXA) for post tonsillectomy hemorrhage in a 3-year-old patient. The patient had a copious amount of oral bleeding and had failed treatment with nebulized racemic epinephrine and direct pressure was not an option due to the patient's cooperation and small mouth. 250 mg of IV TXA was given via nebulizer with a flow rate of 8 L. Bleeding stopped 5-7 minutes after completion of the nebulizer. The patient was then taken to the OR for definitive management. No adverse effects were noticed. TXA in the pediatric population has been shown to decrease surgical blood loss and transfusions in cardiac, spine and craniofacial surgeries. Studies have also been done in pediatric patients with diffuse alveolar hemorrhage using doses of 250 mg for children less than 25 kg and 500 mg for those who are greater than 25 kg. Bottom line: There are case reports of nebulized TXA use in the pediatric population with no adverse outcomes noted. More research is needed. Schwarz W, Ruttan T, Bundick K. Nebulized Tranexamic Acid Use for Pediatric Secondary Post-Tonsillectomy Hemorrhage. Annals of Emergency Medicine 2018. Epub ahead of print. DON'T NEUROPROGNOSTIC EARLY (OR IN ED)! And traditional poor prognostic signs may not be as poor as previously thought! The pole acts as a lever to amplify the forced Abduction of the thumb as the outstretched hand hits the ground. Let go before you hit the ground!! Acute Disseminated Encephalomyelitis (ADEM) is primarily a pediatric disease and can cause a wide variety of neurologic symptoms. As such, should always be in the differential for pediatric patient presenting with vague neurologic symptoms including altered mental status. It is an immune-mediated, demyelinating disease that can affect any part of the CNS; usually preceding a viral illness or rarely, immunizations. The average age of onset is 5-8 years of age with no gender predilection. It usually has a prodromal. That includes headache, fever, malaise, back pain etc. Neurological symptoms can vary and may present with ataxia, altered mental status, seizures, focal symptoms, behavioral changes or coma. MRI is the primary modality to diagnose this condition. Other possible indicators may be mild pleocytosis with lymphocyte predominance, and elevated inflammatory markers such as ESR, CRP. These findings, however, are neither sensitive nor specific. First-line treatment for ADEM is systemic corticosteroids, typically 20-30 mg/kg of methylprednisolone for 2-5 days, followed by oral prednisone 1-2 mg/kg for 1-2 weeks then 3-6-week taper. For steroid refractory cases, IVIG and plasmapheresis may be considered. ADEM usually has a favorable long-term prognosis in the majority of patients. However, some may experience residual neurological deficits including ataxia, blindness, clumsiness, etc. MRI is the diagnostic modality of choice. If ADEM diagnosed, start treatment early in conjunction with pediatric neurology. Title: Was there someone to administer take-home naloxone during a fatal opioid overdose? Take home naloxone (THN) programs have been expanded to help reduce the opioid overdose-related deaths. A study was done in Australia to characterize a cohort of heroin overdose deaths to examine if there was an opportunity for a bystander to intervene at the time of fatal overdose. 235 heroin-overdose deaths were investigated during a 2 year study period in Victoria, Australia. In 34 cases, decedent was with someone else. Half of these witnesses were also significantly impaired at the time of the fatal overdose. The opportunity for intervention by a bystander was present in only 19 cases. There was no witness or bystander in majority of overdose deaths. THN alone may only lead to modest reduction in fatal heroin overdose. Title: How Good are Emergency Physicians in Estimating ICH Volume? 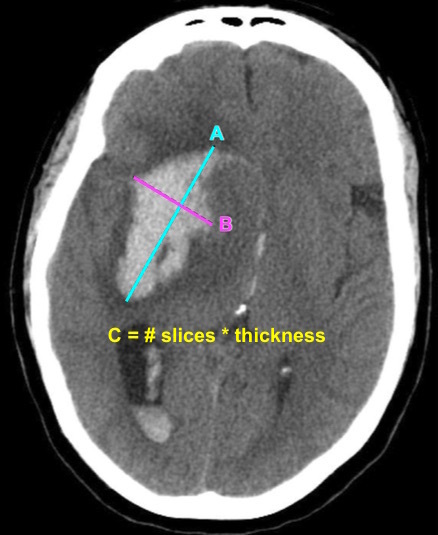 Intracerebral hemorrhage (ICH) volume is a predictor of mortality and clinical outcome. Communicating ICH volume to neurosurgical and neurocritical care consultants can help direct treatment decisions. A recent study by Dsouza et al. found that EM attendings as well as EM trainees were reliable in estimating ICH volume using ABC/2 compared to radiologists. Bottom Line: EPs can reliably estimate ICH volume using the ABC/2 formula. Communicating ICH volume to neurosurgical and neurocritical care consultants can help direct treatment decisions. Renal transplant patients are at high risk of critical illness from a variety of etiologies. Sepsis is the most common reason for critical illness and ICU admission. Due to their immunosuppression, renal transplant patients are at risk of a multitude of infections. Notwithstanding, acute bacterial pyelonephritis of the transplant is the most frequent cuase of sepsis, followed by bacterial pneumonia. Be sure to consider these two etiologies when faced with a critically ill, septic renal transplant patient. Darmon M, et al. Ten tips to manage renal transplant recipients. Intensive Care Med. 2019. epub ahead of print. ---Early antiviral treatment can shorten the duration of fever and illness symptoms, and may reduce the risk of some complications from influenza. ---Early treatment of hospitalized adult influenza patients with oseltamivir has been reported to reduce death in some observational studies. ---Clinical benefit is greatest when antiviral treatment is administered within 48 hours of influenza illness onset. Oral oseltamivir is the recommended antiviral for patients with severe, complicated, or progressive illness who are not hospitalized, and for hospitalized influenza patients. Recommended duration for antiviral treatment is 5 days for oral oseltamivir. Longer daily dosing can be considered for patients who remain severely ill after 5 days of treatment. ---residents of nursing homes and other chronic care facilities. Centers for Disease Control and Prevention. Influenza antiviral medications: summary for clinicians. https://www.cdc.gov/flu/professionals/antivirals/summary-clinicians.htm (Accessed on January 8, 2019). Dyspnea may occur in up to 50% of intubated patients and has been associated with prolonged mechanical ventilation. A number of assessment tools are available to detect dyspnea in the intubated patient. Decavele M, et al. Detection and management of dyspnea in mechanically ventilated patients. Curr Opin Crit Care. 2019; 25:86-94. The European Society of Intensive Care Medicine (ESICM) recently released a review with recommendations from an expert panel for the use of IV fluids in the resuscitation of patients with acute circulatory dysfunction, especially in settings where invasive monitoring methods and ultrasound may not be available. Bottom Line: Utilize all the information you have about your patient to determine whether or not they require IVF, and reevaluate their physical and biochemical (lactate) response to fluids to ensure appropriate IVF administration and avoid volume overload. Title: Is there a significant adverse effect associated with double dose ingestion of a single medication? Taking a double-dose of a single medication is presumed to be safe in most cases. However, there is limited data to support this assumption. A retrospective study of the California Poison Control System was performed to assess adverse effects of taking double dose of a single medication. During a 10-year period, 876 cases of double-dose ingestion of single medication were identified. Adverse effect from double dosing is rare. Seizure can occur with tramadol and bupropion. A previous pearl discussed medication-overuse headache (MOH). MOH is also known as analgesic rebound headache, drug-induced headache or medication-misuse headache. It is defined as headache… occurring on 15** or more days per month in a patient with a preexisting headache disorder who has been overusing one or more acute treatment drugs for headache with symptoms for three or more months. The diagnosis is clinical, and requires a hx of chronic daily headache with analgesic use more than 2-3d per week. The diagnosis of MOH is supported if headache frequency increases in response to increasing medication use, and/or improves when the overused medication is withdrawn. The headache may improve transiently with analgesics and returns as the medication wears off. The clinical improvement after wash out is not rapid however, patients may undergo a period where their headaches will get worse. This period could last in the order of a few months in some cases. The meds can be dc’d cold turkey or tapered depending on clinical scenario. Greatest in middle aged persons. The prevalence rages from 1% to 2% with a 3:1 female to male ratio. Migraine is the most common associated primary headache disorder. ** Each medication class has a specific threshold. Triptans, ergot alkaloids, combination analgesics, or opioids on ten or more days per month constitute medication overuse. Use of simple analgesics, including aspirin, acetaminophen and NSAIDS on 15 or more days per month constitutes medication overuse. Caffeine intake of more than 200mg per day increases the risk of MOH. Consider MOH in patients in the appropriate clinical scenario as sometimes doing less is more! Title: Pediatric intubation: Cuffed or uncuffed tubes? Historically uncuffed endotracheal tubes were used in children under the age of 8 years due to concerns for tracheal stenosis. Advances in medicine and monitoring capabilities have resulted in this thinking becoming obsolete. Research is being conducted that is showing the noninferiority of cuffed tubes compared to uncuffed tubes. Multiple other studies are looking into the advantages of cuffed tubes compared to uncuffed tubes. The referenced study is a meta-analysis of 6 studies which compared cuffed to uncuffed endotracheal tubes in pediatrics. The pooled analysis showed that more patients needed tube changes when they initially had uncuffed tubes placed. There was no difference in intubation duration, reintubation occurrence, post extubation stridor, or racemic epinephrine use between cuffed and uncuffed tubes. Bottom line: There is no difference in the complication rate between cuffed and uncuffed endotracheal tubes, but uncuffed endotracheal tubes did need to be changed more frequently. Liang C, Zhang J, Pan G, Li X, Shi T, He W. Cuffed versus uncuffed endotracheal tubes in pediatrics: a meta-analysis. Open Med. 2018; 13:366-373. Selective serotonin reuptake inhibitors are the most common anti-depressant used today. However, the use bupropion in adolescents is increasing due the belief that it has fewer side effects than TCAs. Using the National Poison Data System (2013 – 2016), the adverse effects of bupropion were compared to TCA in adolescents (13 – 19 years old) with a history of overdose (self harm). Bupropion overdose results in significant adverse effects in overdose; however, death is relatively rare. Sheridan DC et al. Suicidal bupropion ingestions in adolescents: increased morbidity compared to other antidepressants. Clin Toxicol. 2018;56:360-364. Lumbar punctures (LPs) are a common ED procedure with variable reported success rates. A recent systematic review and meta-analysis looked at 12 studies comprising 957 adult and pediatric patients comparing pre-procedural ultrasound-assisted LPs with traditional landmark-based technique. Some studies utilized ultrasound-assistance in all LPs, others selected patients who were anticipated to be difficult LPs. No studies assessed dynamic ultrasound-guided LPs. Overall, ultrasound-assisted LP was 90.0% successful compared with landmark-based LP that was 81.4% successful (OR 2.22, 95% CI = 1.03 - 4.77). Ultrasound-assisted LP was also associated with reduced rate of traumatic LPs, shorter time to successful LP, and reduced patient pain scores. Bottom Line: Consider using pre-procedural ultrasound-assistance for all lumbar punctures. Noninvasive ventilation (NIV) is a primary therapy for patients with acute hypercapnic respiratory failure, especially those with an acute COPD exacerbation. Notwithstanding its benefits in COPD and acute cardiogenic pulmonary edema, NIV should be used cautiously in patients with "de-novo" respiratory failure. Many patients with de-novo respiratory failure will meet criteria for ARDS and have a high rate of intubation (30% - 60%). The use of NIV with delayed intubation in this patient population has been associated with increased mortality. Thille AW, Frat JP. Noninvasive ventilation as acute therapy. Curr Opin Crit Care. 2018; 24:519-24. Heyer and Idris., 2014. Pediatr Neurol. Does analgesic overuse contribute to chronic post-traumatic headaches in adolescent concussion patients?